“Happiness at someone else’s expense came at a price. Tia had imagined judgment from the first kiss that she and Nathan shared. All year, she’d waited to be punished for being in love, and in truth, she believed that whatever consequences came her way would be deserved.” Five years ago, Tia fell into obsessive love with a man she could never have. Married, and the father of two boys, Nathan was unavailable in every way. When she became pregnant, he disappeared, and she gave up her baby for adoption. But when Juliette intercepts a letter to her husband from Tia that contains pictures of a child with a deep resemblance to her husband, her world crumbles once more. How could Nathan deny his daughter? And if he’s kept this a secret from her, what else is he hiding? Desperate for the truth, Juliette goes in search of the little girl. And before long, the three women and Nathan are on a collision course with consequences that none of them could have predicted." Randy Susan Meyers has crafted a heartwarming but seriously affecting book. Not much happens in the way of action, this is more like a play, where the action is driven through words and character interactions. Don't let that scare you off! This book is truly crafted so well, so seamlessly, that you quickly turn page after page, watching these women learn truths, discovering lies, and begin to question their own reasons for their feelings,actions and reactions. Three women thrown together because one, Tia, had an affair with a married man and that affair produced a baby. Three women who control each other's lives, whether they want to or not. In the center of them all is the little five year old. I love that the author made adoption an option here, my favorite family member was adopted and so I am aware of the joys and complications that come with adoption. The Comfort of Lies brings us together as a family or group of friends. See, I really liked each of the women, Tia, Carolyn and Juliette. Author Randy Susan Meyers has written real people, we know women like them, we are women like them. We make bad choices for the wrong reason, we make good choices for the wrong reason, we make good choices for the right reasons and we all make good choices for the best of reasons. We do the best that we can. Who's to know how our choices affect people we don't know? We have to live with those choices, and I like the way the characters dealt with and worked out their emotions, in real and believable ways. I haven't read a book that dealt with real live issues in such an honest way, no fantasy endings and no fairy tale unreality. But I can promise a strong, believable ending. 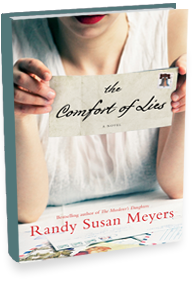 The Comfort of Lies takes the reader in a wonderful, thought provoking journey, I can see this being a great book club selection because the situations and the women are so wonderfully written, it automatically opens the door for discussions. I can't drag you to a book store or an online book seller, but I can tell you that I think it's worth your time and money to add this to your "need to read" list. Matter of fact, bump it to the top. I did. I'm adding it to my own book club selections, I hope you read it, it's heart warming and heart breaking. Both in a good way. I sure hope Ms. Meyers' agent is actively looking for someone to option The Comfort of Lies for a movie or a play adaptation, it'd be perfect! This e-galley was provided to me by the publishers through NetGalley in exchange for a true and honest review.